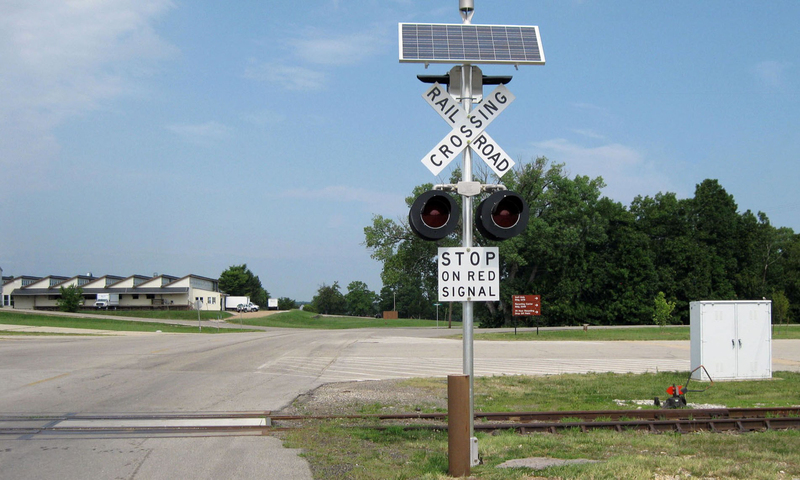 Designed for industrial areas and rural lines, our solar powered signals use wireless sensors to detect approaching trains, then activate the crossing lights and bell until the train has passed. Signals are normally delivered in pairs, one on each side of the crossing, and synchronized to turn on and off at the same time through a wireless link. Easily installed on a standard rail foundation, there are no long cables or external boxes at all. Solar power technology eliminates the need for conduit and external wiring. It is normally shipped already pre-tested and assembled including bells. The system is also available with wireless remote controls, wireless infrared, or wheel detectors with wireless link activation. --Each signal has a bell and railroad crossing sign. --Two flashing systems on each signal, one driven from the activator, and a second from a key switch manual override. For more information about the sensors check Tech Specs or contact us. 90 to 140 Watt solar power system on each mast. 1 x 110 Ah deep cycle solar battery. The solar panel meets Class 1 Division 2 and shock resistant requirements. Normally, the signals can be active up to 4 hours per day. The weatherproof metal control box houses the battery, circuit breakers, terminal strips, microprocessor flasher assembly, and 3 position key switch (OFF-MANUAL-AUTO). 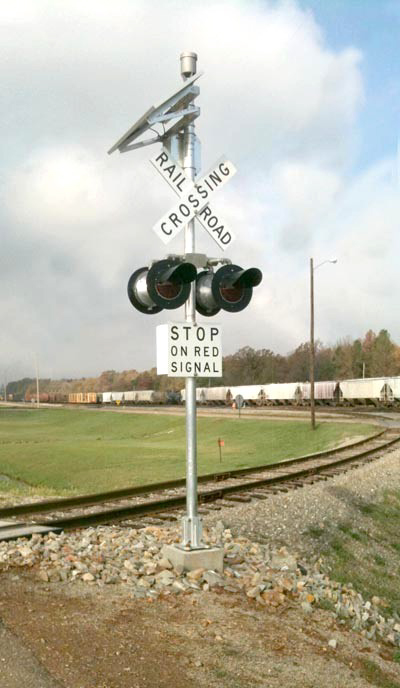 Standard: 2 or 4 - 12” (30 cm) red LED’s in standard housings on arms, MUTCD standard railroad crossing signal. One 2.4 GHz peer to peer data link module per pole synchronizes signals at a crossing to activate and deactivate simultaneously. The master signal to slave signal range is 100 m (300 ft.). 1.2 m (48”) MUTCD standard RAILROAD CROSSING sign and 61 cm (24”) STOP or STOP ON RED SIGNAL sign, English or Spanish. 15’ 6” x 4” (4.73 m x 10 cm) aluminum pole with 9.5” (24 cm) bolt spacing base clamp, ready for mounting on customer supplied industry standard foundations. Standard electronic bell on top of a pole with 80-95 dBa at 10 feet (3 m), adjustable sound level output. Wiring is fully connected to each component and tested before shipment. The Microwave and Remote Control Crossing Signals are solar powered and delivered mostly assembled on pallets. Solar powered microwave sensors detect approaching trains between 1mph and 35 mph. Installed on a signal mast, the lights start flashing 15 to 20 seconds before the train reaches the crossing, flash as long as the train is moving through the beam and continue to flash until the train has left the crossing. If the train stops, the lights will flash for up to 15 minutes then turn off. Standard features include interference suppression and prediction software, drivers for up to four 30 cm high intensity LED lights, driver for electronic bell and override circuits. Using microwave sensors, the Remote Sensor detects trains approaching and passing between 1 mph - 35 mph for industrial areas or 2 mph - 100 mph for rural areas. This Sensor can be solar powered and does not need track circuits, and will send a control signal to crossings up to 5 miles away. The Remote Sensor may be used instead of track detector circuits to activate a crossing. The Remote Sensor is also used when there are 3 or more tracks located. The internal microwave sensors are aimed to detect trains approaching the crossing that may be blinded by another train. Transmitter: One 960 MHz or 2.4 GHz peer to peer data link module synchronizes data between the Remote Microwave Activator and the crossing or remote signs. Range: short range version, 1,200 feet, long range version up to 5 miles. 80 Watt solar power system with 110 A hr. deep cycle solar battery. The solar panel meets Class 1 Division 2 and shock resistant requirements. The system is rated for 24 hours continuous use without sunlight. 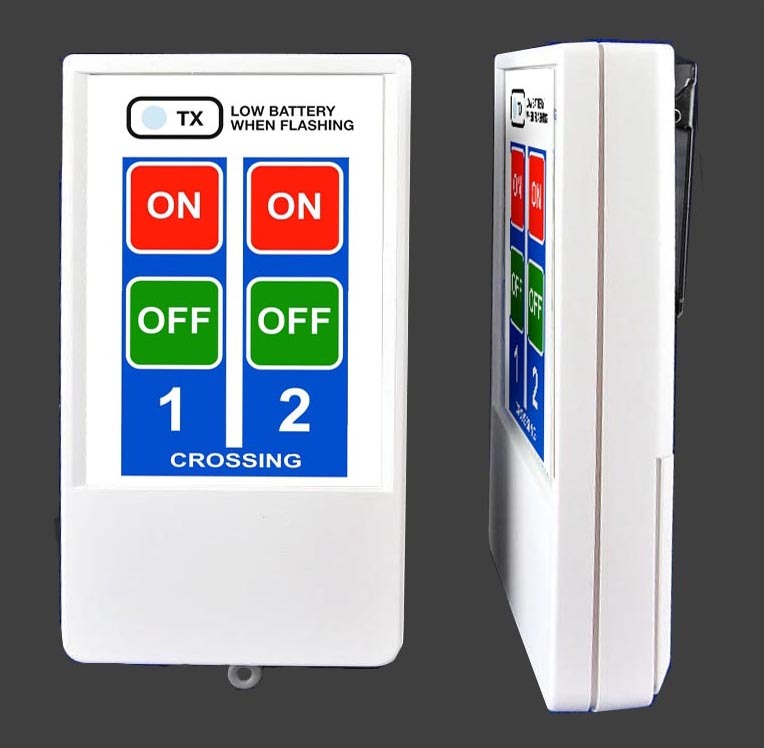 The weatherproof metal control box houses the battery, circuit breakers, terminal strips. 15’ 6” x 4” (4.73 m x 10 cm) MUTCD standard aluminum pole with 9.5” (24 cm) bolt spacing base clamp, ready for mounting on customer supplied industry standard foundations. The Remote Sensor is solar powered and is delivered assembled. Magnetic coil wheel detectors can be attached to the track up for to 1,200 feet from the crossing to detect approaching trains, which then wirelessly activate the crossing signals. The system is entirely solar powered with wireless data links, thus they do not use any long cables or external wiring. The lights start flashing as soon as the train passes over the approaching track detector and continue to flash until the last car has passed over the exit detector. Signals from the track detectors are wirelessly linked to the master signal at the crossing. A wireless data link synchronizes the slave signal to the master signal. 30 to 80 Watt solar power system with 8 to 20 A hr. Deep cycle solar battery. The solar panel meets Class 1 Division 2 and shock resistant requirements. The system is rated for 24 hours continuous operation without sunlight. 10’ x 3” galvanized steel with poured concrete foundation or 15’ 6” x 4.5” aluminum pole with 9.5” (24 cm) bolt spacing base clamp, ready for mounting on customer supplied industry standard foundations. The Industrial Area Crossing Signal is solar powered. The signal is turned on and off wirelessly with handheld remote control transmitters. Multiple signals may be separately activated by one transmitter. Units are shipped already assembled, ready for mounting on a foundation. Each system includes both transmitters and signals. Each signal is normally installed on finished foundations in about 3 hours. The system operates on the master-slave concept. The master signal contains the receiver for the remote control. The master then sends a wireless signal to the slave for synchronization. 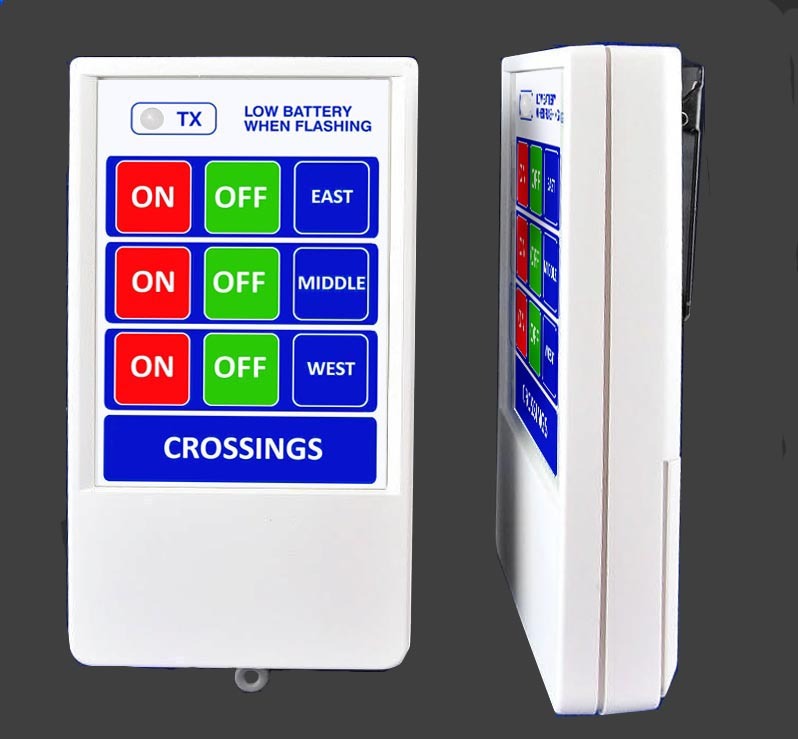 The system is expandable up to 10 crossings on individual channels using one transmitter. Transmitters: 2 x handheld transmitters, 2,000 feet range. Receivers: 1 Remote Control, 2.4 GHz or 960 MHz Receiver on mast. One 2.4 GHz peer to peer wireless data link module per pole synchronizes signals at a crossing to activate and deactivate simultaneously. The range is 100 m (300 ft.). 80 Watt solar power system with 110 A hr. Deep cycle solar batter. The solar panel meets Class 1 Division 2 and shock resistant requirements. The system is rated for 24 hours continuous operation without sunlight, with lights and bell activated 10% of the time. 4 x 12” (30 cm) bright red LED’s in standard housings on arms, MUTCD standard railroad crossing signal. The flashing rate is the industry standard 0.5 seconds on, 0.5 seconds off. 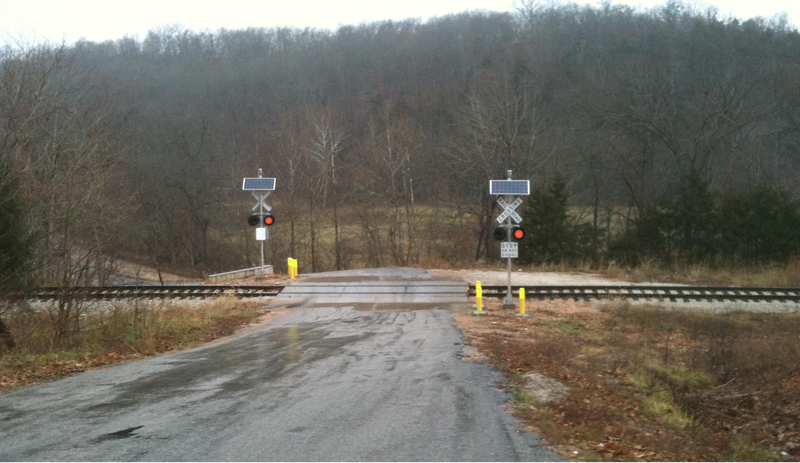 Two Infrared (IR) transmitters are strategically placed on each side of the crossing up to 50 feet from the track. Two IR receivers are located on the crossing masts. As a train approaches or stops at the crossing, the beams are interrupted and the signals flash until the train has left the crossing. 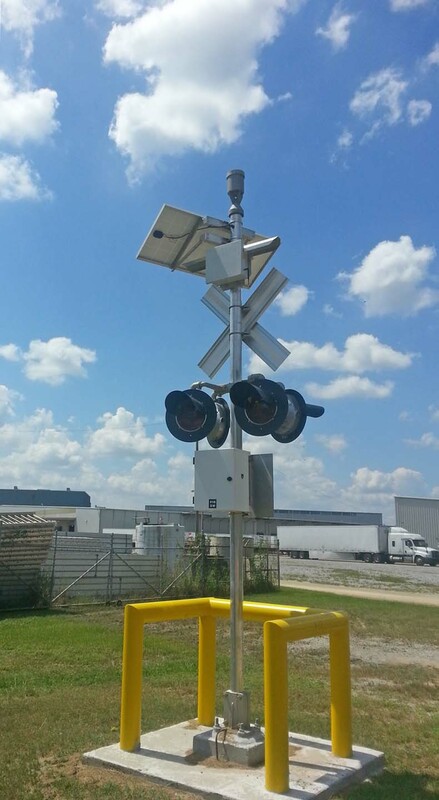 This system can be installed for both single and multiple track crossings for up to 6 tracks. It may be stand-alone or installed as an add-on to other activators. IR transmitters are strategically placed on each side of the road at the crossing, so when trucks are stopped within the crossing perimeter or moving through the crossing when the lights activate, it will prevent the gates from closing down on the trucks. 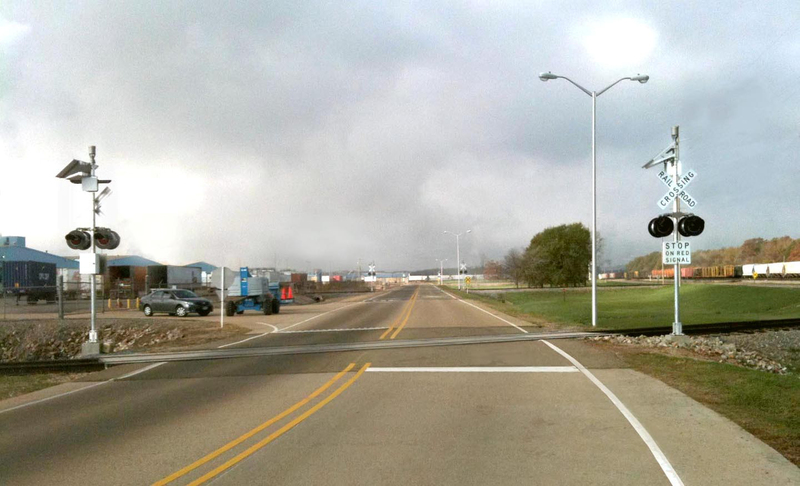 If there are no trucks at the entrance or exit to the crossing, the gates will come down 5 seconds after the lights are activated. This system is intended for use at any crossing where gates are needed. 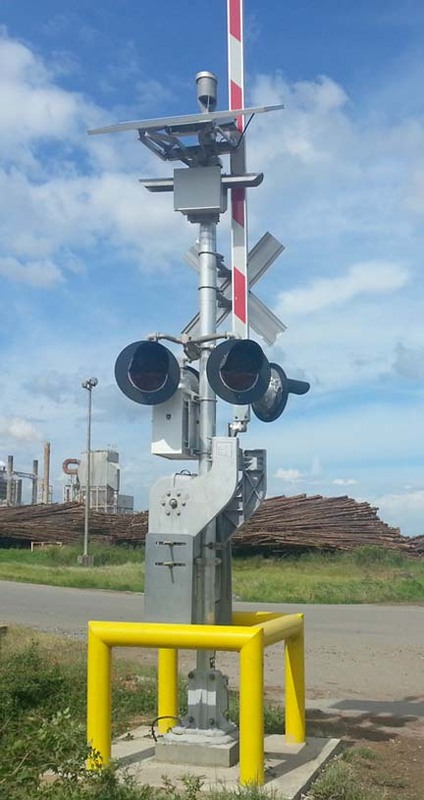 This all-weather microwave remote sensor measures the distance to rail cars in its narrow 10° beam. Cars within a programmable window of 3 m to 25 m are detected. It is normally mounted on the signal pole with its beam perpendicular to the track. Multiple outputs are available for indicating the presence, distance, and time a car is within the range window. The sensor may be powered by 12 V DC, 110-240 V AC, or solar.